Kare-kare (ka-REH ka-REH) is one of the Philippines' signature dishes. Like adobo, kare-kare is going to turn up on every and any top ten lists of Philippine dishes to try. Admittedly, up until I made our own version of kare-kare, I didn't eat kare-kare. During gatherings and get-togethers, everybody would be ooh-ing and aah-ing about kare-kare, but I kept my distance and I kept my cool. I've tasted a bit here and a bit there, but in almost every presentation of it I have come across, it just wasn't appealing to me. Kare-kare, as I saw it then, just looked like an unappetizing stew. It was brown, it was thick, it was saucy, and more often than not, there was a pool of oil collecting on top. I doubted its appearance and sometimes I also doubted its provenance. See, being one of the nation's "signature" or "iconic" dishes, there was no lack of kare-kare instant or powdered mix to be bought on supermarket shelves. I wondered if people just didn't put a pack or two of "instant" kare-kare flavour to some boiled beef parts. I didn't want to use any of these instant powdered mixes, because -- well, I just didn't want to. I asked around for anybody who knew how to prepare kare-kare and it seemed like everybody used a kare-kare mix. There would be brand considerations and preferences when it comes to the instant mix (Mama Sita, Knorr), but it was still all instant mix. I looked around for a kare-kare recipe online and after reading through several recipes I tried to consolidate my taste-memories and newfound knowledge into a simple recipe that encapsulates the essence of kare-kare. The intriguing thing I discovered was the use of toasted rice powder. Hmm... very promising. I never knew toasted rice powder was used in kare-kare. We've used toasted rice before in what we've been calling our Thai waterfall beef salad. 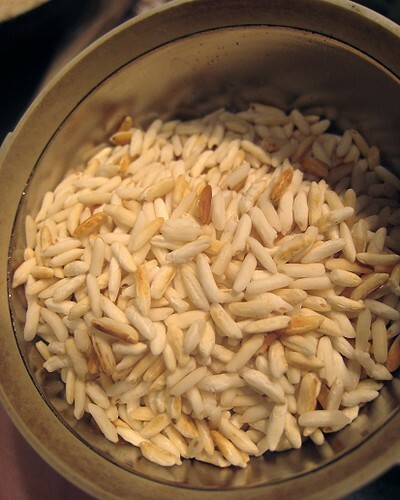 Toasted rice has a deep, nutty flavour that's just awesome. 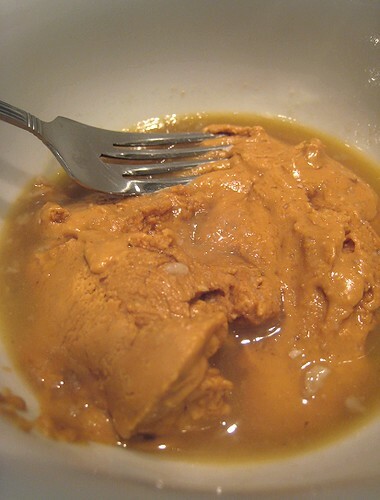 In this dish, it also acts as a thickening agent. 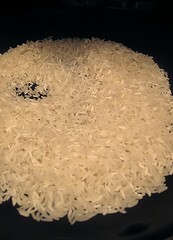 It's as simple as toasting raw rice in a dry pan, then grinding the grains in a coffee grinder. Whoa, look at that color. 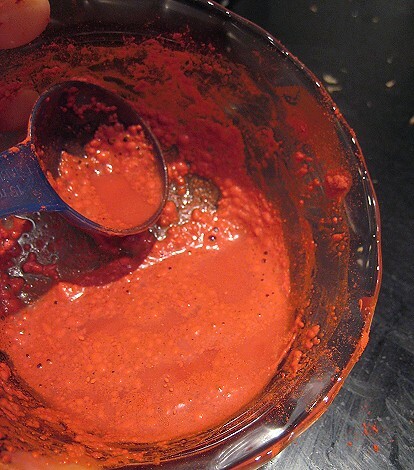 That's some atsuete (achiote/annatto) powder being dissolved in water. We've also used atsuete seeds by pounding the seeds in a mortar and pestle, adding hot water and steeping them. The seeds are then strained out. I used peanut butter as my peanut component because I'm not that much of a fanatic. I suppose one can roast some peanuts then grind them to a paste themselves, if that's the fancy. When we feel like going all-the-way-traditional, we add banana blossoms (puso ng saging) to our kare-kare. We don't obsess about them, though. We've never seen fresh banana blossoms around, so we use canned. Having the cans in the pantry allows us to have this traditional component when we have these kare-kare cravings. 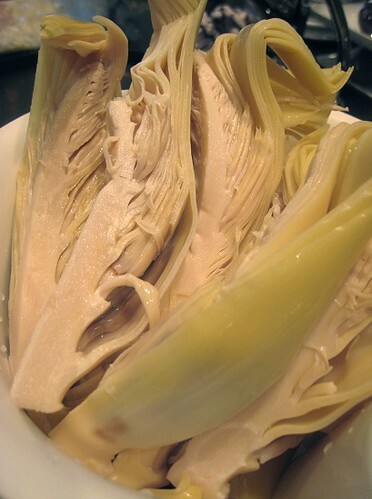 Again, these two vegetables are traditional vegetables found in kare-kare. 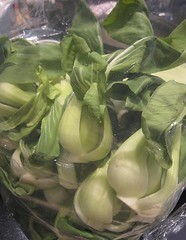 We've used both bok choy or Shanghai bok choy. The choys are more or less interchangeable, at least to me. Some people also add string beans or long beans (sitaw). I don't know why we don't have string beans in our kare-kare. I think it's because for some reason, JS doesn't like them. In most recipes, the oxtail pieces were first cooked until tender (usually by boiling) before being stewed or braised with the rest of the ingredients. 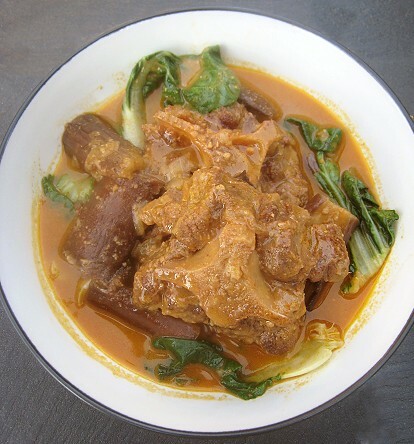 JS tried this the first time she made kare-kare and while the dish was delicious, the meat fell apart and made the stew quite messy-looking. 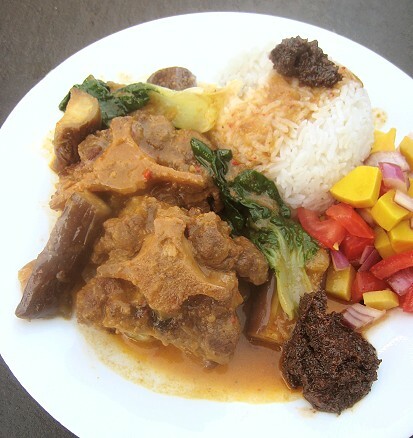 So for our version of kare-kare, we simply brown the oxtail first. The two hours or so braising the stew is more than enough to tenderize the meat. Browning the meat also takes care of the broth problem. In most recipes, they would call for the addition of beef broth as the braising liquid. Which just boggles the mind, because in my opinion, oxtail in water would already create its own delicious broth. 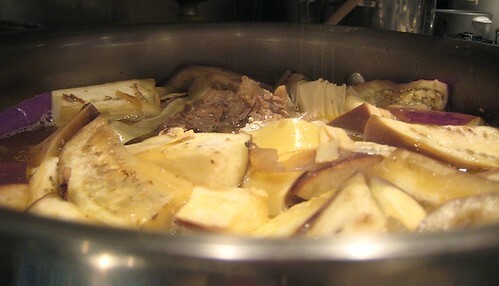 After the initial browning, the rest of the dish follows the usual easy dump-into-a-pot braising method. After browning the oxtail pieces, we set them aside and cook some garlic and onions. The oxtail pieces go back in and we add water to cover. At this point, we also add the atsuete. We let it boil, then turn the heat down to let thing simmer. This takes about an hour or almost two. We want the oxtail to be tender, but not falling off the bone. Remember that there's still some time to go with the stew, because the eggplant and bok choy needs to cook. Next, we add the banana blossoms and eggplant. The toasted rice powder also goes in. We then add the peanut butter; we add some of the hot broth to the peanut butter first to make it looser and easier to mix into the stew. 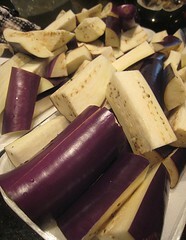 We let the stew cook some more until the eggplant is tender. 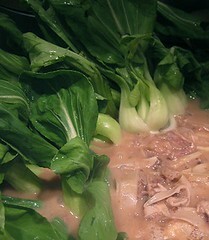 We add the bok choy near the end (about 10 to 15 minutes before serving) as we don't like them too soft. JS uses fish sauce to season the stew as she goes along. Making kare-kare the "traditional" way with toasted rice powder, I had imagined that the rice powder would enhance the nuttiness of the peanut butter. I tried a version with the rice powder and I also cooked a version without. My recollection might be a bit fuzzy now, given that both times are about 4 months apart, but there wasn't really a discernible difference (yeah, speaking 6 months after the fact) between the two versions. In our version (the recipe below), I've included rice powder as an option. But, one can simply use a different thickening agent. In our sans-rice powder version, I dusted the oxtail pieces with flour before browning and also added a fourth of a cup of flour when sautéeing the onions. The eggplants are really wonderful in this dish. Their own inherent creaminess just goes together with the rich, deep beef flavours of the stew. The banana blossoms added a little bit of crunch (they're similar to artichokes in texture), but I've made kare-kare without the banana blossoms too. Essential are the green vegetables at the end, because they add a light, fresh, greenness to the hearty stew. 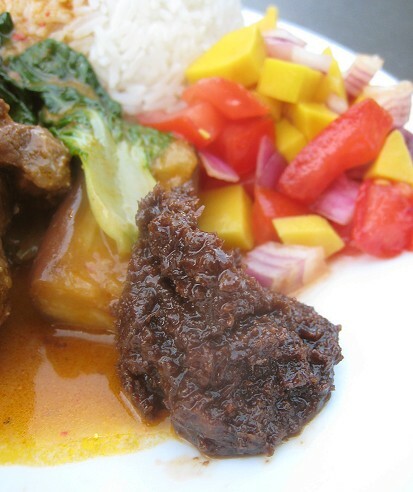 Bagoong is the must-have condiment when eating kare-kare. 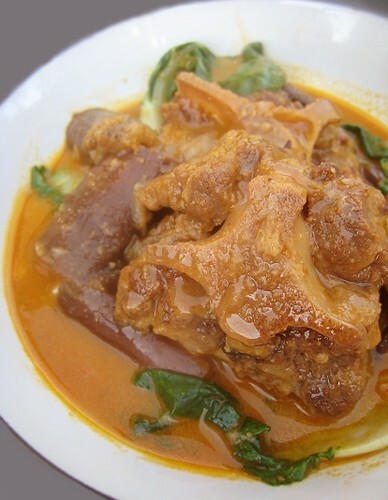 To serve kare-kare without it is unimaginable. Actually, it is not merely a condiment, it's an integral part of the dish. While having kare-kare with bagoong over rice is more than delicious enough, I decided to go all out and make this mangga ensalada (previously seen during Starry, Starry Night). This is a simpler version with just the pickled mangos, red onions and tomatoes. I usually mix in the bagoong directly with the mango salad, but I left it as is this time and simply added the bagoong while eating. 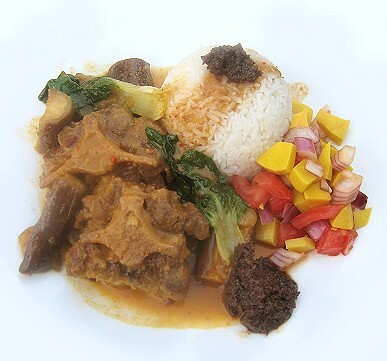 Rice, the kare-kare with oxtail and vegetables, its sauce, the mango salad and bagoong! My heart is palpitating and I'm getting weak in the knees just thinking about and looking at it! Heat oil in stewing pot. Season the oxtail pieces with salt and brown in hot oil. You may need to do this in batches. 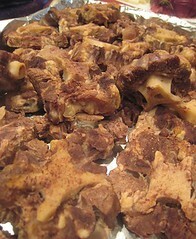 When browned, take out oxtail pieces and drain off excess oil, leaving about 2 tablespoons in the pot. In the same pot, add garlic and cook until fragrant. Add in onions and sauté until lightly brown. 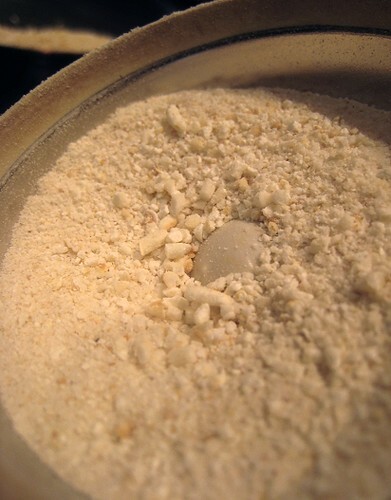 Add flour to onions and continue stirring until the flour is cooked and slightly toasted. Add the oxtail pieces back into the pot and add water to cover. 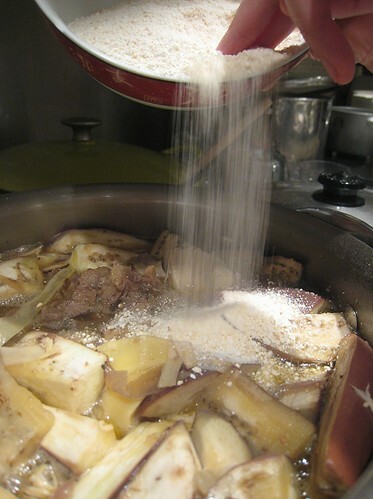 Add the dissolved achuete powder and its liquid (straining, if desired). Let the oxtails boil and simmer for about an hour or a little bit longer. Add the eggplant pieces and banana blossoms. If using, also add in the toasted rice powder. 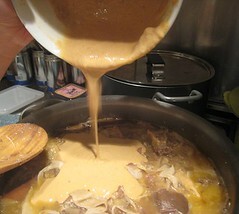 Add some of the hot broth from the stew to the peanut butter and mix to loosen the peanut butter. Stir into the stew. Let simmer until the eggplant pieces and the oxtail pieces are tender. Depending on how you like your vegetables, whether crisp or soft, you can add the bok choy earlier to let it cook through and soften or fifteen minutes before serving to retain their crisp freshness. Adjust seasoning (salt and pepper, and/or fish sauce). Serve with bagoong (shrimp paste) and eat over rice. 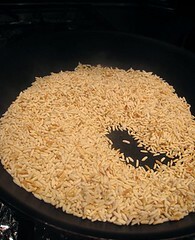 In a dry pan, toast 3/4 cup raw rice grains until lightly brown and fragrant. Grind in coffee grinder. OMG, you just made my day!! this is one of my favorite pinoy dishes, whenever i have a chance to taste them i do!! they look awesomely delicious! thanks for sharing the recipe! i'll try makign them on mayumi's bday!! WOW that looks soooooooooo delicious! To me, that's a new way of making stew. Wow! 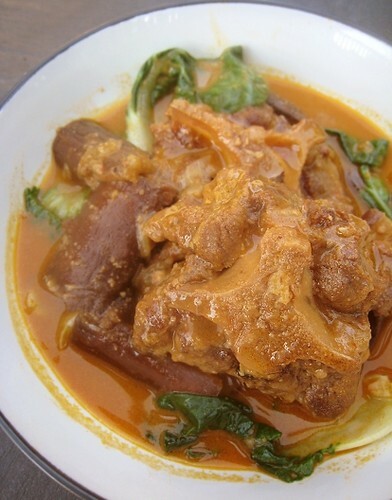 Wow, what a fabulous post.....which reminds me, it's been so long since I've had Kare Kare. Are banana flowers used in many other traditional Filipino dishes? I've been scratching my head over what to do with them. OMG. 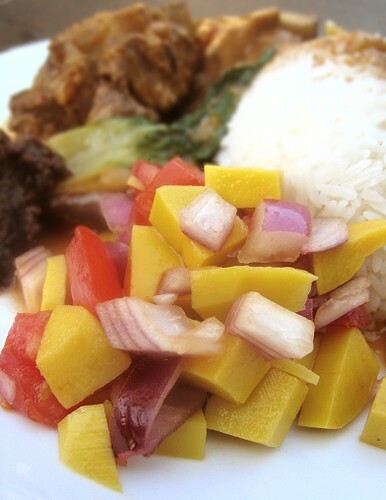 Seriously, that plate of kare kare with the mango salad AND bagoong looks amazing. I love how all these work so well with each other! I would so love to taste your version of this awesome dish. All the components are amazing. Kudos to you both for sharing this. This dish looks amazing, and very complex! Don't know how you managed to do anything else but cook. Haven't had oxtail in ages, my mom use to make oso bucco all the time. Yeah, there's not much meat on them bones! Ah, I'll be expecting a kare-kare post. ;) Not really sure, re the banana flower. Haha... that mango salad put it over the top! LOL. Haha... good thing there's two if us. Division of labor. Oxtail is not very frequent visitor in our household, just because it's beef and hence, tends to be much more expensive. Wow, I've never had Kare-Kare or Banana Blossoms, but I am always looking for more ways to have oxtail. This really is fantabulous. Would love to see your take on it. I really love Filipino foods specially your kare kare. I miss this recipes back home in the Philippines. thanks a lot for sharing!